You Haven’t Missed a Thing- We record most presentations! Did you know we strive to record every presentation that we sponsor/co-sponsor? We know people are busy and might not have the time drop everything for our schedule. So we’ve compiled our videos into one place for your easy viewing. You can always hover over the Resources tab and you’ll find our link to the Audio/Visual page, where you’ll find strong presenters such as Winona LaDuke, Mari Margill and local UO professor Craig Kauffman. Learn more about the effects of Corporate Rights on communities around the world, Rights of Nature inserted into constitutions and Community Rights work in general all on one page! Grab a cup of tea and wrap yourself in a warm blanket and learn more! We have a lot of great presentations coming your way, and did I hear someone say Campaign? Don’t miss this month’s Community Rights Action as we have so many things to talk about. And we just can’t get enough of Chuck Willer! We are also thrilled to have Evaggelos Vallianatos, author of Poison Spring: The Secret History of Pollution and the EPA, speaking not only on our PIELC panel, but several times along the coast! Don’t miss the action! We’re due to hear from the judge any day now. We’ll be discussing the possibility of running a successful campaign. We’ve got a panel at this year’s Public Interest Environmental Law Conference! There’s also a Rights of Nature panel – don’t miss out! Friday, March 2 – 3:50 p.m.-5:05 p.m. The aerial spraying of toxic pesticides is part of Oregon’s logging legacy. This panel will discuss the challenges communities have faced in their efforts to protect people and ecosystems from aerial spraying, as well as the state’s role in providing legal protection. From Carol Van Strum’s efforts against the federal government in the 80s and the widespread corruption in the EPA, to the community rights movement of the last five years, the panel will discuss the ups and downs of the battle to abolish aerial spraying. 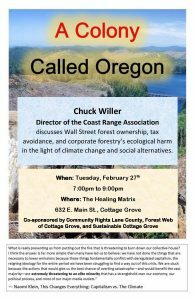 Panelists will highlight the lengths that corporations and government have taken to stop local democracy. Does a wolf have a right to survive because it runs, breathes, and values its family (the pack)? Does a forest have a right to exist, thrive, and flourish solely because it is a living entity? Does nature have rights? According to our political and legal systems, it does not. Laws and governments were not designed to recognize or respect the natural world. Rather they define it as property to be extracted and consumed for profit. That is at the heart of the damage being done to our planet, and until it changes, any idea of protecting Mother Earth is an illusion. Fortunately, Rights of Nature are starting to be acknowledged and enacted as law. From Ecuador to the United States, to Nepal, and New Zealand; Tribal nations, communities, activists, indigenous peoples, and governments throughout the world are advancing Rights of Nature initiatives. This panel will talk about the Rights of Nature and what’s being done to get our political and economic systems to recognize them. Ernie Niemi is a scientist and natural resource economist trained at the University of Oregon and Harvard. As President of Natural Resource Economics, Inc., he specializes in economic-impact analysis to understand the economic importance of natural resources. 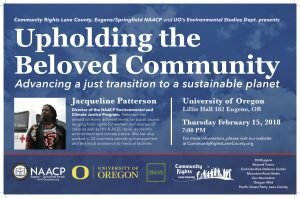 He has been active on numerous advisory boards, including the Citizen’s Task Force for Developing a Strategic Plan for the Oregon Dept. of Fish and Wildlife, and the Technical Advisory Committee on Land Use and Economic Development for the Oregon Dept. of Land Conservation and Development. The Signatures are being Delivered to the County Clerk! As we deliver the petitions for certification to the Lane County Elections office at 275 W10th Ave. in Eugene. Thanks to your hard work, we have collected more than 15,000 signatures calling for a BAN on the aerial spraying of herbicides by timber corporations! 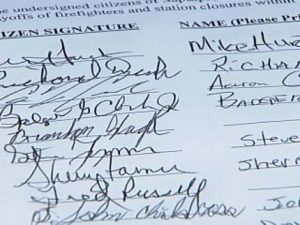 The amendment requires 11,500 signatures of registered Lane County voters, but public support has been so strong the final tally has far exceeded our goal. Help us generate press coverage and send a message to corporations that The People Are United! Bring your friends, family, and neighbors, and we will see you there! Big Announcement at this month’s CRA! Thank you to everyone that came out last month after the eclipse. We had lots of fun and enjoyed everyone’s company. You helped us with a very good cause. We have some great news this month! We’re ready to take the next big step, are you with us? If you’ve been wanting to get involved, this is the time to do it. We hope to see you Monday! Join our groundbreaking movement to protect our communities from corporate harm! Community Rights Lane County educates citizens about our rights to local community governance. We believe decisions affecting communities must be made by community residents – the people affected by these decisions and laws. We believe corporate structures should not have privileges that elevate corporate interests above community rights. Copyright © 2019 Community Rights Lane County. All Rights Reserved.